Is your engine running optimally or does it need a tune up? Just like a car is not performing at its best when its engine doesn’t run optimally, your body will give you signs when your engine isn’t optimally tuned. When your thyroid is over active everything in your body speeds up which in turn leads to weight loss, insomnia, loose stool, heart palpitations, excessive sweating, anxiety and even panic attacks. Your thyroid is a butterfly shaped gland that sits in your neck area and it produces thyroid hormones which are needed in nearly every single cell in your body. There is no physical piping that connects the thyroid to the cells, the hormones are carried to their destinations by travelling with the blood stream. The amount of hormone produced in a day is microscopic, if you could put it in the palm of your hand you would not even be able to see it and yet it has a profound impact on your bodies overall performance. The process is as delicate as a butterfly’s wings. Thy symptoms can be subtle and because they are seemingly unrelated, they may be put down to other causes. A working mum with young children may be told that it’s normal to feel tired, irritable and have memory issues because it’s tough when you are not sleeping through the night and juggle a job and a family. Thyroid testing often only looks at TSH (Thyroid Stimulating Hormone) and T4 (the inactive form of thyroid hormone) because that is what’s covered by the health insurance. It is however possible to be hypothyroid with normal test results (also see my previous article on this subject). The thyroid gets told by the brain (the hypothalamus and pituitary gland to be precise) to make thyroid hormone and how much of it to make. The main hormone that the thyroid produces is T4. T4 is inactive and can be seen as the storage of thyroid hormone, that is available for conversion into T3, the active form of thyroid hormone. Think of T3, more specifically free T3, as the fuel that is needed by your cells. The cells have receptors designed for free T3 to dock onto in order to rev up your metabolism. However, these receptors can get blocked by reverse T3. Reverse T3 acts as the breaks in the system. Although the role of reverse T3 is still not very well known, tests show that it is elevated in people under chronic stress and people who have mercury toxicity. When the free T3 receptors get blocked by reverse T3 you can have hypothyroid symptoms because the fuel is not reaching it’s destination. If you have symptoms of hypothyroidism, i.e. 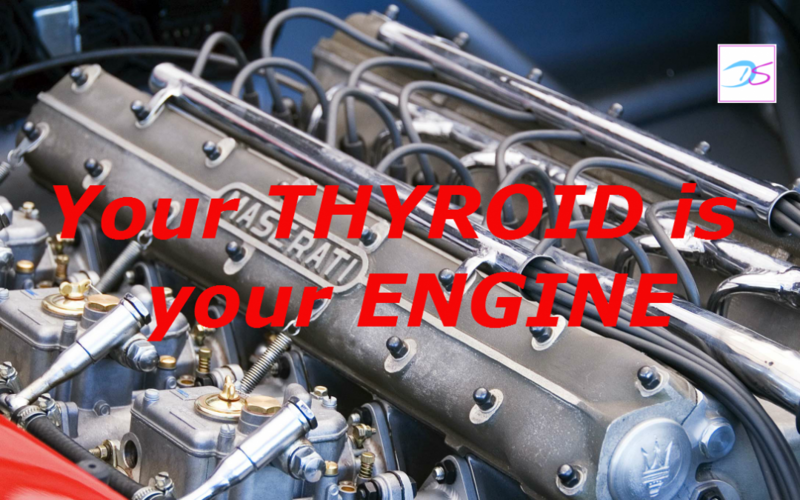 those described above when your thyroid is underactive, it is worth to investigate further even if your TSH and your free T4 levels are normal. Take control of your engine so you can feel your best. If you like to receive more self-empowering health tips like this, you can subscribe to my newsletter here.